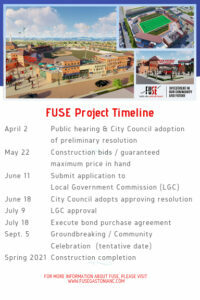 A number of important dates are coming up in Gastonia’s Franklin Urban Sports and Entertainment (FUSE) project. 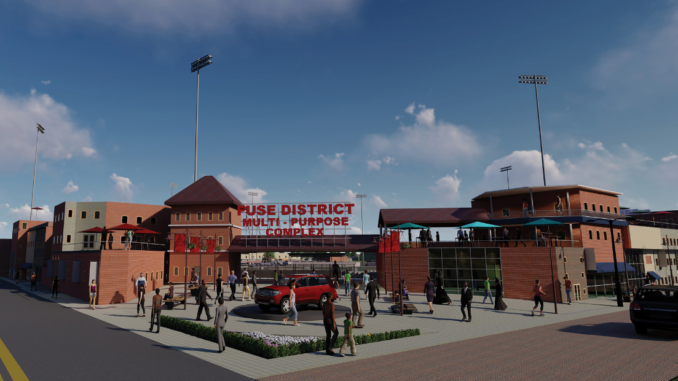 FUSE is an economic development effort to bring a multi-purpose stadium to Gastonia’s downtown area by spring 2021. The FUSE facility is designed to be the centerpiece of multiple private development projects that will surround the facility and bring millions in additional investment to the area. “We have a public hearing scheduled at the next City Council meeting on April 2 that begins the process for borrowing money to construct the FUSE project,” City Manager Michael Peoples said at the last City Council meeting on March 19. The LGC, staffed by the Department of State Treasurer, reviews and approves the issuance of debt for all units of local government and assists those units with fiscal management. In reviewing each proposed borrowing, the LGC examines whether the amount being borrowed is adequate and reasonable for the projects and is an amount the unit can reasonably afford to repay, according to the nctreasurer.com website. The memorandum of understanding with Lansing Melbourne Group for the development agreement for Trenton Mill: “We’ve had some conversations recently with them and a lot of work will be put into that in the next month,” Peoples said. UNC School of Government Development Finance Initiative (DFI) is preparing a solicitation for development proposals for the Coca-Cola/Choice building and a parcel on the FUSE facility site that could possibly be a hotel. “Hopefully we’ll be getting that out to the public in April,” Peoples said. Trenton Street is currently closed due to utility improvements in that area.